The teaser introduces a little blonde girl in blue running away from possessed/cursed dalmatians controlled by what appears to be her wicked stepmother who ominously tells her change is coming now her father’s gone. This entails locking her into an attic bedroom not unlike the one in Kenneth Branagh’s Cinderella. In fact, but for the twenties aesthetic (love! ), Cruella’s history reads so much like Cinderella’s I assumed ‘Cruella’ was a cruel nickname given to young Ella, that older Ella in turn embraced as a shield, right up to the final reveal. Once Upon a Time has given all its villains (and all its heroes for that matter) painful childhoods and mean parents to explain their villainy and Cruella seemed to fall right into that, at this point tried and true, and most importantly familiar trope. But no! She is actually really truly evil right down to her core and has been all along. The mother was only wicked because Cruella had killed her own father and she decided locking the child up in a tower was the best course of action because parents on Once Upon a Time barely ever make good (or sane) choices. Cruella is corrupt, not corrupted, always cruel, never Ella. And that’s great. Cruella shouldn’t be redeemed – she wants to turn puppies into a coat. And anyway, virtue isn’t the only path to depth. Cruella is clever to trick Isaac, the Author, into helping her escape and play on his own desires to be a hero, not just an observer. She uses people to get what she wants. She knows exactly who she is and she doesn’t apologize for it. The world underestimates her and she’s going to prove it is to their peril. Cruella is a terrible person and I love her. But just like the backstory isn’t really sympathetic, the episode isn’t really about Cruella, or her virtue, at all. It’s about everyone else’s. Exhibit A through L in “parents make bad choices”, these two fools. To recap: they stole Maleficent’s unborn baby, put all of Snow’s unborm baby’s ‘darkness’ into it and then got it (and Cruella + Ursula) exiled to another land. Now that Emma knows all this, she’s mad. Her parents have always held themselves up as paragons of Good and Right – heroes, not villains – and now she knows it wasn’t always the case. Snow and Charming decided to be paragons of Good and Right precisely because of their not always heroic choices and also the whole point of this series is that the lines between hero and villain are murky at best, but Emma’s having none of it. I would like them all to go into family counseling. Archie: Emma, why are you angry with you parents? Emma: How much time do I get? Snow: Everything we did we did to save you! Emma: Did it ever occur to you I didn’t need saving? Charming: Making righteous choices for everyone else is kind of our thing. Snow: Plus we were under a lot of stress due to the death threats. Regina: Don’t drag me into this. Archie: To be fair, you’re a central part. Henry: Take it as a compliment, Mom, if you’re here you’re family! Regina: But the entire town is here. Henry: Welcome to my life. Anyway, Emma’s anger is more justified than Snowing’s genetic manipulation, but Regina and Hook are correct that based on precedent she is overreacting. 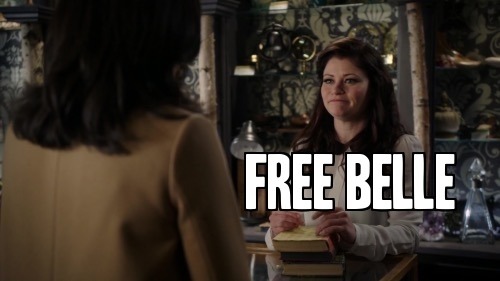 Regina’s virtue is a lot like Snowing’s in that she justifies villainy with results – using Belle to trick and threaten Rumple is acceptable if it gets them closer to understanding his scheme (and it is implied that she at least gets Belle’s permission). Regina straight out says “it’s Emma’s heart we’re protecting, not mine” indicating she’s comfortable with her role (at least, today). 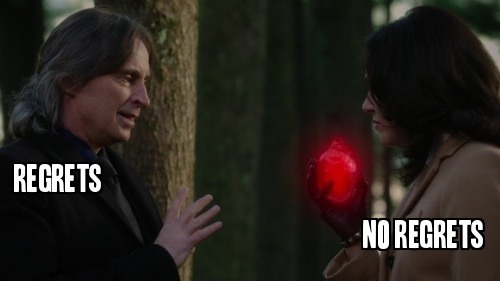 In contrast, Rumple seems tired of the whole thing…tho it could just be Robert Carlisle being tired of the whole thing. Regardless, I do appreciate when Rumple’s toys start taking back to him. Speaking of toys, Isaac (the Author) is the latest pawn to try and make something more of his life. I do like all the Gatsby references and the roaring 20s frame for Cruella. Also: Isaac’s explanation that Cruella’s land “exists outside time” explains Gotham and therefore it is my new headcanon that Gotham is an AU of Once Upon a Time. 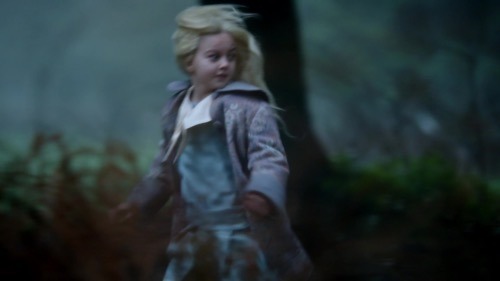 Anyway, Isaac is a sad little pawn passed from the Sorcerer to Cruella to Rumple but I can’t feel too badly for him when there’s Belle being passed around from her father to Rumples to Regina back to Rumple back to Regina back to whoever the authors need her to be used and abused by next week. Anyways, as Regina pointed out, it’s Emma’s virtue at the heart of the matter. Since season one we’ve been told “Evil isn’t born, it’s made” but I guess no one told Snow White? Because she and her husband went to great lengths to make sure Emma wasn’t born evil the way Cruella was. But then Rumple has been going to even more great lengths to ensure that first Regina and now Emma are made evil and I guess it’s working because Emma killed Cruella. Except Emma killing Cruella to save her son is hardly the act of an evil mastermind. More like the act of a mother pushed to the brink by death threats. If I sound contradictory and confused it’s because this episode/series is contradictory and confused. Great visuals though.